Preplanning started on a Tuesday. Now, I established a habit last year, beginning with the first Friday with students, to have #TicklingTech sessions. We met Friday mornings, 30 minutes before report time, to learn something new and (hopefully) useful. The concept is to spend 15 min. learning and demonstrating and then 15 min. where the teachers can try it out themselves on their devices or mine. It rarely worked that way. Instead, some days we spent 30 min. working on a demonstration. Some days we spent all of the time with everyone trying something out without a demonstration. The group ranged in size from 15 down to 3. But we met every single Friday morning that I was in the building. At the end of the initial 15 min., whether you stayed or not, we ate. One teacher suggested that we rename it to #TantalizingTech. I baked, my sister-in-law baked more (and better) and we enjoyed a special treat for coming early on Friday mornings. So, yes, I had a plan for the first Friday of school with the students. But a big part of coaching teachers is not guiding them down your chosen path but helping them on theirs. During preplanning this year, it was announced that all teachers would turn in their lesson plans on Edmodo. That’s a great way to organize lesson plans except for one problem. Over 90% of the teachers at the school had never used Edmodo. Never. And, during the summer, half of the classrooms at the school received brand-new interactive projectors. So, even though it was not on the original schedule, I called a hasty start to the year with #TicklingTech on Friday morning BEFORE the students arrived. We turned on the new interactive projector and used it to show how to log on to Edmodo with the school code. A definite twofer. And it seemed to be successful. In one case, a teacher did not come but her student teacher did. The student took the info back to the teacher and showed her how. The next big thing was to do it again. So Wednesday afternoon, once the busses were gone, more teachers came and learned how to use the new boards while getting themselves set up on Edmodo. It was powerful to start so early and so strong. But it got me thinking. How do you start off the year? When do you start coaching teachers? There are so many things going on in the first two weeks, three weeks. Share your best ideas and gain new ones. 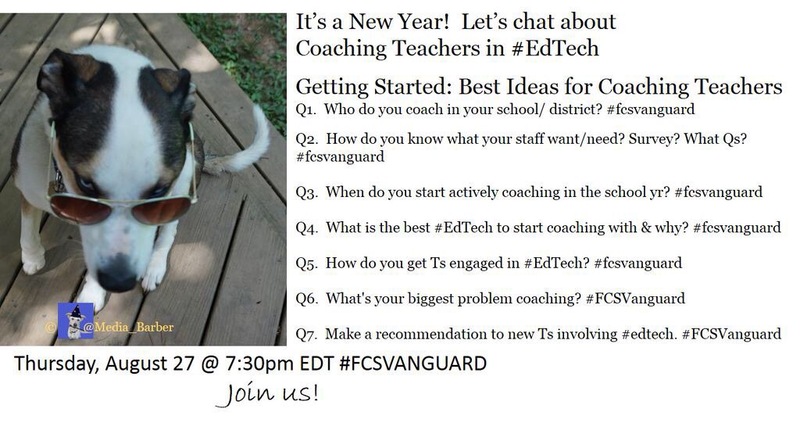 Join me on Thursday, August 27, 2015 @ 7:30 pm ET for a Twitter chat on #FCSVanguard to discuss when and how you start coaching other teachers. « A Glimpse into a Teacher’s Summer Vacation: Ready? Set? Go!